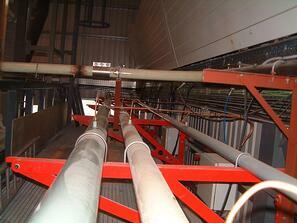 Are you properly monitoring your Pneumatic Transport System? Air pressure controlled, pneumatic process control systems are used extensively for conveying powder and bulk solids in many industries. Improperly controlled systems can result in problems for the manufacturing process. Blockages Flow/No Flow monitoring), material drop out (More Flow/Less Flow monitoring), or product damage can occur when the product velocity is not directly measured and controlled. For example, during pneumatically transported breakfast cereal operations, the lack of product velocity control can result in significant product damage. Often the solution is to simply increase the air flow in the system, but the actual effects of this action is unknown inside the pipe or duct. There is a need for more sophisticated, particulate velocity control technology to help minimize such product damage. Recent electrostatic/triboelectric (ET), product flow velocity demonstrations indicate that help is on the way. Furthermore, this new, alternative process flow monitoring and control technology may assist or replace other means of measurement and control of pneumatic transport (PT) processes. While air pressure adjustment is most commonly used to adjust and maintain PT flow, it is an indirect method of process flow control. ET technology provides direct and instantaneous process material flow measurement rather indirect flow control by air pressure adjustment. And unlike typical triboelectric systems requiring an intrusive probe, this new technology platform will rely on non-intrusive ring sensors to provide the measurement without disrupting the flow of material. Direct measurement of particle velocity using electrostatic/triboelectric technology for flow control (versus air pressure adjustment on demand) will present distinct flow control advantages for many pneumatic transport process control operations. More efficient control of flow dynamics by direct, real time, product flow velocity measurement could also result in energy savings by helping to reduce excessive and expensive motive air pressure when less material is loading into the air stream. Furthermore, real-time and accurate ET product flow velocity data can be correlated with load and weigh cell data to measure mass flow to help confirm and mange processes. Elimination of high maintenance and expensive process material, mechanical scales will also reduce operating costs. Are you trying to manage these types of applications? Would knowing the particle velocity inside the pipe or duct be a valuable parameter to know what is going on? Let us know about your applications so we can see how we can help. Please contact us for a free consultation or search our blog for more information regarding our TRIBO line of products and their use in process applications.